Nedbank, established partner of the Cape Winemakers Guild for over two decades, has extended its sponsorship of the Guild until 2020. As a proud supporter of the Cape Winemakers Guild since 1995, Nedbank has played an integral part in the annual Nedbank Cape Winemakers Guild Auction, as well as various skills development programmes through the Nedbank Cape Winemakers Guild Development Trust. ‘Nedbank is proud to continue its support of the Cape Winemakers Guild and the positive transformation journey of a new generation of South African winemakers and viticulturists through the Guild’s Protégé Programme,’ says Tobie Badenhorst, Head of Group Sponsorships and Cause Marketing of Nedbank Group. The Nedbank Cape Winemakers Guild Development Trust was established in 1999 as a joint social investment initiative. In addition to the Nedbank sponsorship, funds for the trust are raised at various Guild events throughout the year including the annual Nedbank Cape Winemakers Guild Auction. The Cape Winemakers Guild Protégé Programme, founded in 2006, has established itself as one of the most successful development programmes in the South African wine industry. Driven by the single-minded vision to transform the industry, the programme has seen a total of 24 talented oenology and viticulture graduates honing their skills while enjoying the rare opportunity of working side by side with members of the Guild. To date there are 17 former Cape Winemakers Guild protégés pursuing promising careers in the wine industry – from private wine estates to larger corporate companies. As technical sales manager at Anchor Yeast, Praisy works closely with winemakers in the selection of yeast strains for wine fermentation. She counts herself fortunate in her current position, being able to continue interacting with and learning from her former Guild mentors. As winemaker at Highgate Wine Estate in KwaZulu-Natal, Thornton Pillay is making his experience as a Cape Winemakers Guild protégé count: ‘The experience gained while working with the finest mentors in South Africa, as well as the opportunity to participate in an international harvest in France, helped me to build up a great portfolio and establish myself in my home province as a winemaker.’ Thornton strongly recommends the programme for its positive influence, character-building capacity and the vast framework of opportunities that it presents. 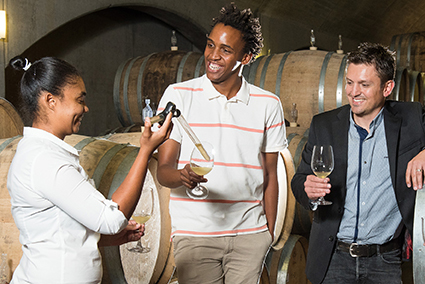 Nedbank has supported the Cape Winemakers Guild Protégé Programme from the onset: ‘Nedbank’s brand identity, see money differently, speaks to both the tradition and transformation of the Guild, which is the foundation of the protégé programme. It is satisfying to hear the protégés talk with such enthusiasm about the new world that has opened to them, and how they get to learn from, and socialise with top winemakers,’ says Badenhorst. Making their own wines is a requirement of the Cape Winemakers Guild protégés and enables these young winemakers to give back to the industry when their wines are auctioned at gala dinners and at the silent auction at the annual Nedbank Cape Winemakers Guild Auction. All funds raised from these protégé wines are ploughed back into the programme. The Nedbank Cape Winemakers Guild Auction will take place on Saturday, 29 September 2018, from 09:00 at Spier Conference Centre in the Stellenbosch Winelands. The auction is open to the public. Telephonic and proxy bidding options are also available to those unable to attend in person. Registration for the auction and VIP lounge will close on Wednesday, 19 September. To find out more and to purchase tickets to the VIP lounge on auction day, visit www.capewinemakersguild.com, send an email to info@capewinemakersguild.com or call +27 (0)21 852 0408. The wines that will be on auction can be tasted by the public in Cape Town on Thursday, 16 August, and in Johannesburg on Wednesday, 22 August, at the Nedbank Cape Winemakers Guild Auction Showcase. Tickets to the showcase can be purchased on www.webtickets.co.za.